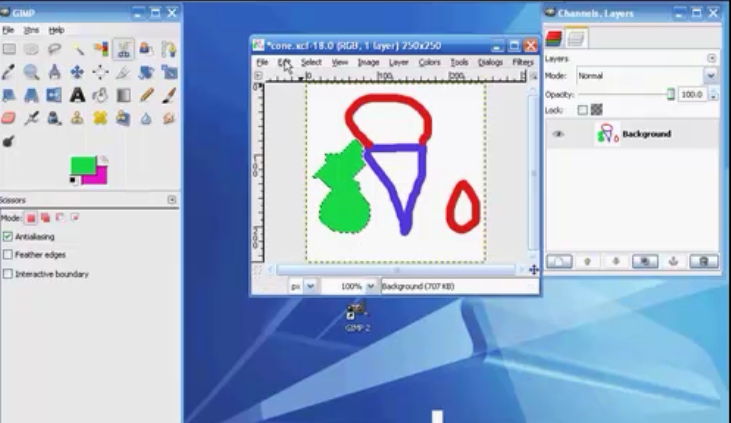 Hello and welcome to this video series on the Gimp. Now in this video, we’re gonna be covering the remaining transform tools namely the Crop Tool, the Rotate Tool, the Scale Tool, the Shear Tool, the Perspective Tool, and the Flip Tool. So let’s go ahead and jump right down into this by opening up an image so we can play around with it. I got one here picked up. It’s kind of a funky-looking dude here where I don’t know if this is a Mohawk or a comb-over got cut in a windstorm. But in either case so, it will be just fine for our purposes. 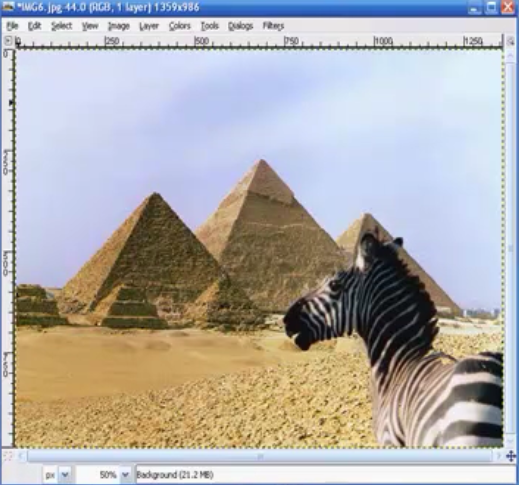 Now then the Crop tool, we got a couple of ways where we can get here and that is just as I did. Click on the icon on our toolbox or you can hold the Shift key down and tap on the letter C, as in cat, on your keyboard. That will get us here as well. Or up along the top here, in the menu, go to tools and remember these are all Transform tools so we go down here to Transform tools, over to Crop, and you can see the rest of the Transform tools we’ll be working with here as well so you can get here for those as well. And here also on the far right, you can see the shortcut keystrokes for those. Or you can just right-click on the image and again go down to Tools and come down to Transform tools in the same thing. So that’s the shortcuts and the ways in which we can get to the different Transform tools when needed. Now with Crop, basically what this is gonna do is cut a section of the image you’re working with out for us to use and leaving the rest of them to the trash can. So we’ve got a few options here that we can work with for the Crop tool. The bottom on here, the Shrink merged and these top two are basically gonna be used if we have multiple layers that are working at the same time. Right now, we will have the one layer; this guy’s image. So as far as this video is concerned, we’re not gonna be touching base on these three items here. 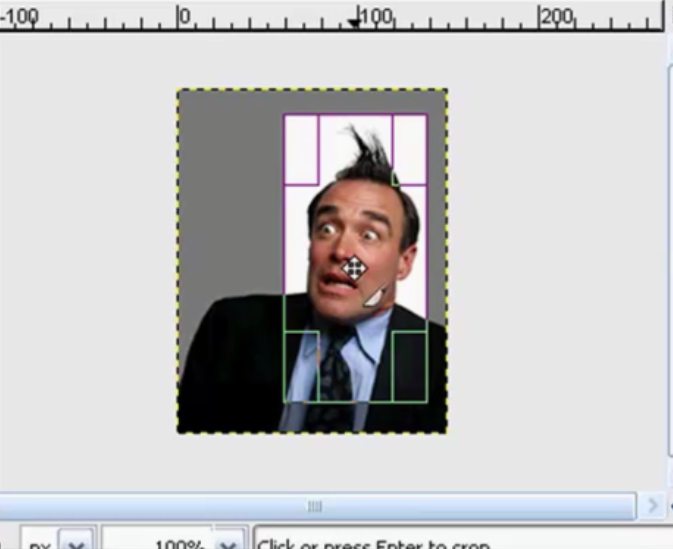 Now the “Expand from Center”, this is simply an additional tool to assist you in deciding what’s gonna be cropped. You can do this just manually. But “Expand from Center” just as it sounds like, you find this pretty much the center of what you gonna be hanging on to. In this case, I just basically wanna keep his head. And so we’re gonna see right around his nose here and just move this until we get pretty much what we want. Now then you just let go of the left mouse button. By the way, that’s what I was doing. I was holding the left mouse button down and dragging it. You’ve got these markers here. You can use this to find between you selection as such. Then again, play around with this until you’re comfy with it because I am not gonna want all of these. I just want the head, not as much as the tie and the hairdo. So that’s the “Expand from Center”. Now we’ve got the “Fixed” here which I’d never really messed with that limits the flexibility of which you can choose. 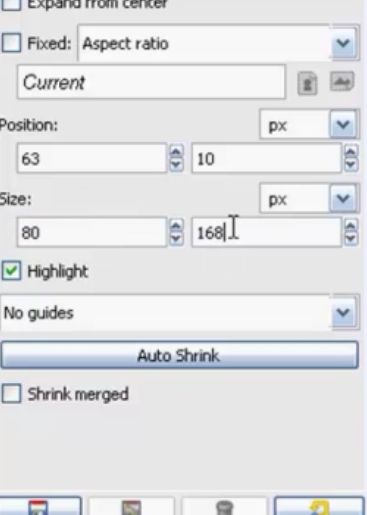 But again, it’s here for a reason so I’m sure that at some point down the line there would be a need for this so that’s what that’s for as to fix either based on the Aspect Ratio, which keeps everything in tune the current size, the Width, the Height, and of course, the Size. But I’d just leave that unticked. And the position is where on the image you’re selection is at and these are more manual of what we’re doing now. I’d rather do it the free form way gonna guess we will more flexibility. The Highlight is basically as you can see here is gray now it’s not. So I’d leave that ticked. Again, that leaves you a little bit more a way to work with. Now this size, if you’ve got an actual dimension that you’re trying to work with, then you could type this in here and eliminate some of the guess work here. For example, if you got 80 by 120 then hit your enter button and there you go. And that’s just about right. Now if you can keep your mouse so the cursor out pretty much right in the center where you’ve got the move tool emblem like this guy here, the four arrows, then you can hold your left mouse button down move this anywhere within the selected region you want. And this sure will work just fine for what we want. Then once you got the area that you want on a crop selected, hit your enter button and boom, there you have it! Now then, that’s the Crop and again you’ve got all these options here you can surround with. Now the Rotate is just like it sounds. Basically, you’re gonna be rotating the image that you’re working with. Now then for these remaining five tools, they’re all gonna have basically the same, well except for the Flip, they’re all gonna have basically the same options available. And I would suggest just leaving the default just as it is. So that way, well again for the sake of this video anyway, that’s what we’re gonna do. The Interpolation is really something that will come into play if you’re dealing with some high-end graphics, very large pixelated, 300 plus DPI resolutions. Otherwise, for the sake of EBook creations or header/ footer type creations then you can just leave this as cubic. 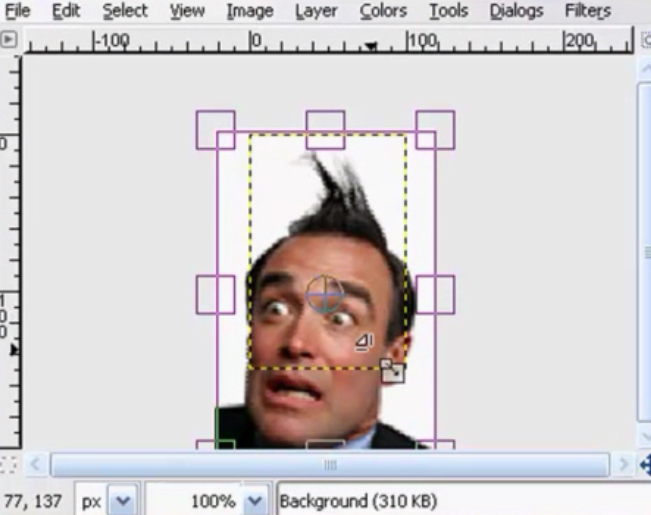 A quick information, what this Interpolation does is as you make your transformations with your making this larger or flipping it, or squeezing the guy’s face together, while you transform it, the Gimp software is trying to determine where this particular pixel is gonna be. You know so that keeps the color as the same no matter how you squeeze his face together so that it keeps the color as blue color are the same no matter how much you stretch it apart. So the Cubic is the most accurate of these three. I’m not sure what the fourth one does but the Cubic is the most accurate of these three. 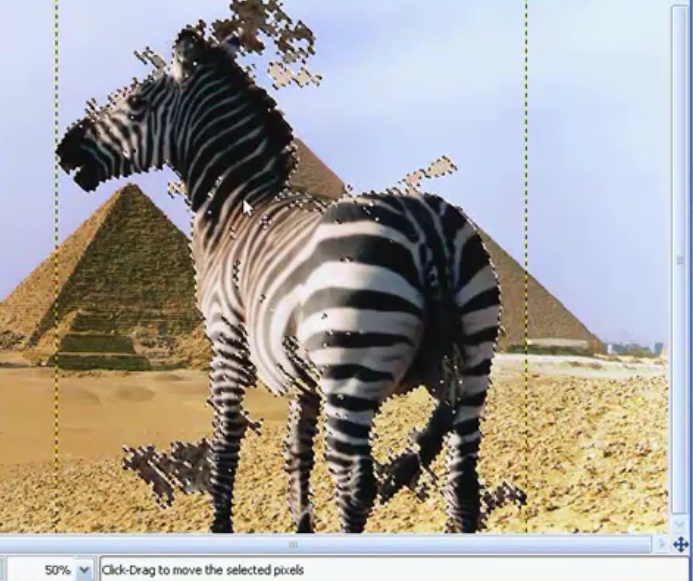 But it takes a little bit longer for Gimp to figure out what where. The None is a little less accurate but it happens a lot quicker and then the Linear is as it is in the kind of the middle, it takes the best of both. It’s little faster than the cubic but a little less accurate than the None if that makes any sense. Now to give you an idea as to why it is really makes no difference whatsoever, the Cubic is as far as we’re working with here, again it’s most accurate and when i say it’s the longest, this might take a matter of say one second. Whereas the None, which is faster but less accurate, might take a 10th of the second. So again, there’s really no difference for what we’re gonna be using here. So we can just leave pretty much all these alone. Now the 15 degree down here, if you hold the control button down your keyboard, what this will do is it will allow you to rotate in 15 degree increments. So with this ticked, let’s say we wanna rotate this guy’s face a 90 degrees, it will do it in 15 degree increments. So if you’re watching up here, you can see that it’s happening in 15 degree increments. That’s one way you can rotate the image you’re working with and this works pretty good too if you’re working with text and say you wanna put this along this side of your EBook creation and you type out the text horizontally, then you grab your Rotate tool and you wanna flip it 90 degrees. Now you could either do so this way with this box ticked or you can type it in here 90 degrees or you can just use the slider bar here and do the same thing. And that’s the Rotate tool. Now the Scale tool, I usually have never really mess with this on the toolbox because I get a little more accuracy for what I’m wanting to do because the Scale is basically changing the size. You either increasing or decreasing this size of the image. So I go up here to the Image on the menu bar and come down here to Scale Image and let’s say this is the original image that we’re working with right now, the original dimensions. Let’s say I want 100 in the width. Well it’s going to maintain the aspect ratio here so that it doesn’t look and fatty. So we type in 100 and then hit Scale. Go to Image, click Scale and as you can see how it adjusted this from 120 to 150 because we increased this by 80 but it increased this automatically by 30. So that’s why I use the image up here and not so much the Scale tool down here in our toolbox because it gives us a little more flexibility up here for some odd reason. Now then if for say you wanted a certain part of this guy’s face right here then I’ve used the scale for that but then again I don’t have that need very often. I’m gonna show you what I’m talking about. Okay so we got this and click on the image here. We’re gonna make it pretty big and you can see the part that is selected, where little ants right around here. Okay so this here we just wanna keep this part of his face selected. So then we hit the enter key and boom! That’s not selected. But then again I don’t have the need for that very often so that’s why I don’t mess with whatever I’m trying to change the size of the image I always use the Image up here. There’s other options you can do up here too that are not available here. And that is, let’s say we wanted to transform. We could flip it, we can rotate it a 180 or 90 degrees. So that’s pretty much what I would use as far as the scale tool is again you’ve got the ability to do so here but I find more accuracy and more abilities here under the image menu. So let’s move on to the Shear tool. Now the Shear and the Perspective tool, I’ve find that they’re most useful for making some odd-looking shapes namely shadow effect on the base of an EBook cover that you’re making. 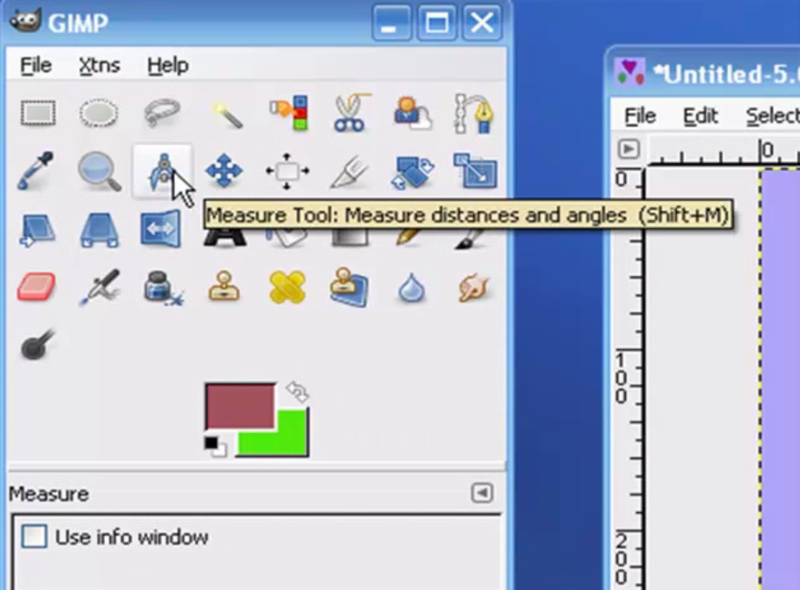 Let’s go ahead and click on this icon so we can get to the Shear tool rather than leaving it up the Scale tool. 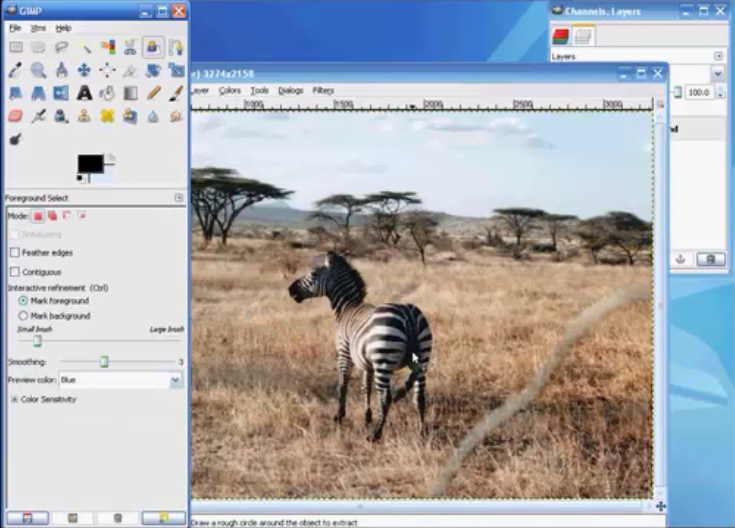 So again as I was saying, this is where you can kinda manipulate the image a little bit. Give it that little look there. And this is the Shear tool and you can get the same type of manipulation ability by using a Perspective tool only a little bit different. I’ll show you what I’m talking about here. Kinda like a page turned or page flipped. That’s what I found before is a people abuse the Perspective tool for those little cornered turndowns, ad type deals, and that’s how they make those or a part of that anyway is to the Perspective tool. Go ahead and get back to the original here. But that’s pretty much the Shear and the Perspective tool, that’s just kinda manipulate the make a little more funky-looking, a better work. We’ve kinda made him even funnier than what he originally was. 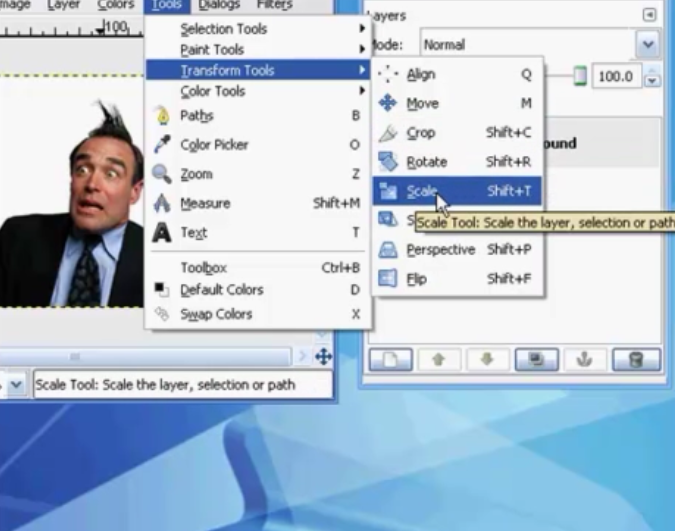 The last in our Transform tools is the Flip tool. And we go and click on this and again we’ve got two options here basically horizontal, or we gonna flip it left or right, or the vertical, or we gonna make him upside down or right-side up. So these are gonna have some pretty useful needs. The Transform tools here again the one that I’ve finally used the most is the Crop, the Rotate, and the Scale tool because these here and I’ve from time to time will use the Flip tool as well. But the Shear, Perspective those are more specialty tools that I have used in the past but not as often as these other four. So I hope you enjoyed this video on the final items in our Transform tools section and I’m sure you’re gonna be able to find a good use for all these tools. So thank you very much for watching and have a great day! 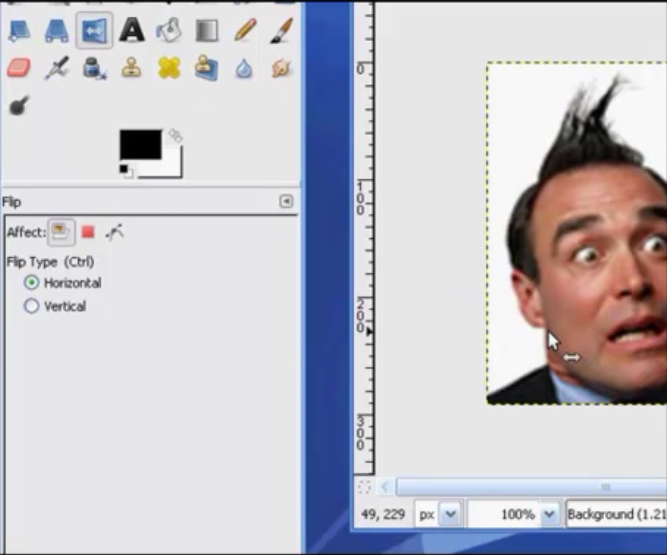 Hello and welcome to this video series on the Gimp. In this video, we’re going to introduce you to the Measuring Tool in our toolbox. Quick shortcut to get to this tool in addition to just clicking on this icon will be to hold your shift key down while at the same time pressing the letter M, as in Mary, on your keyboard. And that will get here just as well. As you can see down in our dialog box, there’s not a whole lot of options. Actually, there’s only one option to choose from and that is to tick or untick the “use info window”. And if we go over here to our little heart image and if click and hold down my left mouse button I want to go ahead and measure up to where the angle starts. And that’s basically what this tool does is it measures distance between points and also provides you the angle or the degrees of angle. So between this point and this point, we’ve got a 110.9 pixels and the angle between the horizontal plane and the line that I drew is 62.05 degrees. Now this information in our status bar can also be shown in the “use info window”. For example, I’ll just go back a step here. Let me get rid of that and let’s go ahead and see what pops up in our “use info window” if we do the same thing. There’s the “use info window” and as you can see the same numbers that show up here also show up here in our info window. And just close this up. That’s pretty much it folks. That’s all there is to the measuring tool in the Gimp. I hope you learned a little something from this. Thank you again for watching and have a great day! 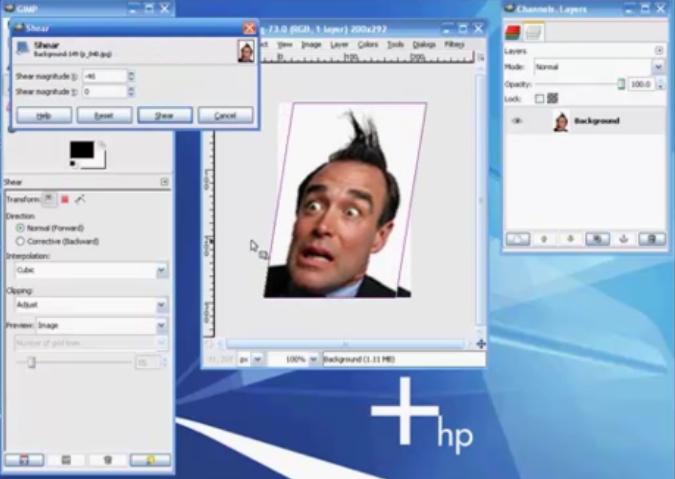 Hello and welcome to this video series on the Gimp. And on this video, we’re going to be touching base on probably our last select tool up here on our toolbox. This one is called the Foreground Select Tool and since I’ve already got us selected this are the options or additional functions that accompany the foreground select tool. And for the sake of this demonstration, we’re going to leave the feather edges off, the contiguous unchecked as well, and this is the default the mark foreground and the small brush these are the defaults right about in here. I’m going to go ahead and keep it closer to the small brush but not only works to dinky but I’ll show you here in a second why. Then the smoothing, this basically default right here is number three. You get much higher then it affects adversely some of the accuracy of what we will be extracting because what this foreground select tool does basically is it allows you to extract the foreground from the active layer or, in this case, from the selected item. The other items here too, the preview color, you have three. No big deal, these are really irrelevant so just leave it or whatever it is setup as. The color sensitivity, I just opened that up just to take a look at it. I would leave that again. I’ll just leave that alone and whatever it is defaulted at. So let’s go ahead and open up an image. 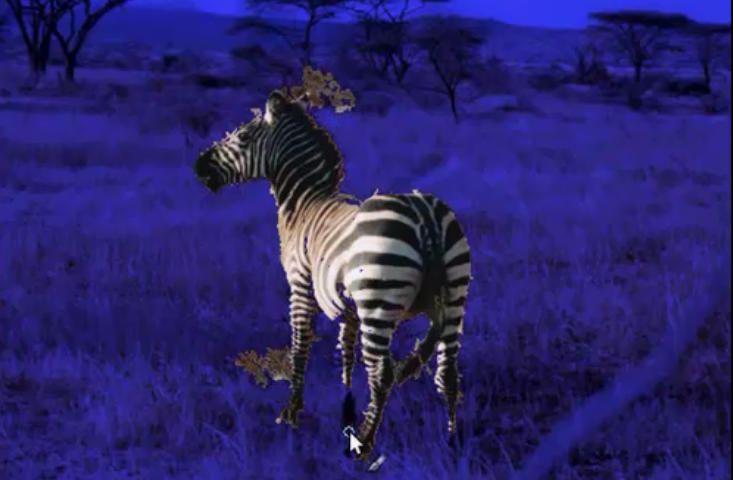 Let’s get this zebra guy out of there. So now then, as you can see with the foreground select tool, close to my mouse pointer we got the little what looks like a lariat just like this guy here. And we don’t have to be accurate at all. Just kind of select around the item we want to extract. I’m not going to go all the way back to the beginning. Just for demonstration purpose, I’m going to let off my mouse button now and it finds the beginning point itself but it does so on a straight line. Be aware of that. Just make sure you’ve got it out here. Of course, it would have been easier for me and better for me actually to go up this way but for demonstration purposes here we go. Now after we’ve done the selection, it gives the paint brush. You can kind of see that there a little bit just below my pointer’s paintbrush. What we want to do is just run the paint brush down the item we’re going to be selecting and again we’re just highlighting it. We’re not trying to fill in all, just letting the tool know what we want to extract. 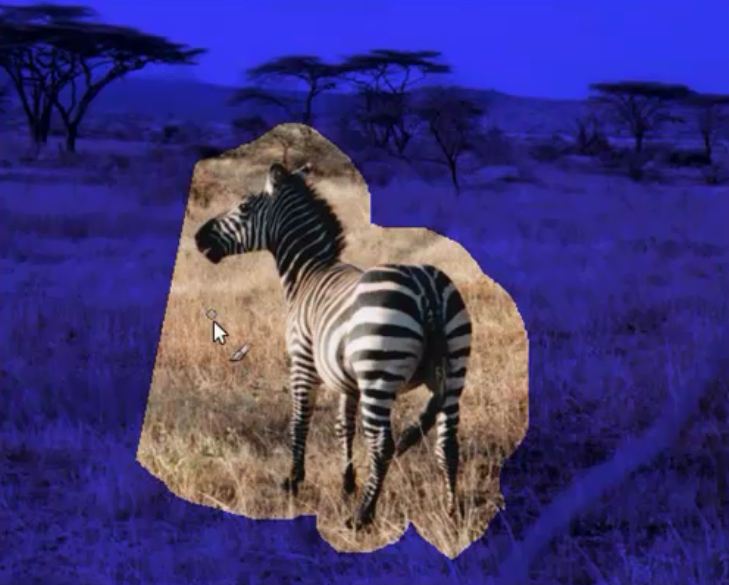 Not to grasp but this item right here, the zebra. Striped donkey. As you can see, there’s some blue right in here and what we’re going to do because we copy this out now or extract this out now then this will be basically invisible spots or holes in our selected item. So we can kind of eliminate that a little bit by saw the paint brush in here. Just painting over these items here. Nothing exact here then let the tool do its thing and it brings him up. Okay cool. Now you see we got some extra garbage up here and down here and it’s not perfect down here. Let’s go and add a little bit more of its leg here. That’s cool. We get a little bit more here. You can see as we do this, it’s adding more and more garbage that won’t need to be cleaned up what we background or the images we place this guy on. But I’m happy with this for the time being. So I’m going to click my enter button and you see all the marching ants, well we’ve got it selected now. You can use the control keys on our keyboard or we can right-click and go to our edit function. You can use the copy, cut, paste, or whatever. We’re going to go ahead and use the and this are the control functions on our keyboard we could use in place of what we’re doing now but I’m using the mouse. So let’s just go ahead and cut this guy out of here and let’s open up another image to paste him onto. What have we got? Yes, the desert. We’ll really freak this donkey out. Anywhere you paste him on here; just right-click, edit, and again we can use the control V like “Victor” on our keyboard or just use this here. Now we paste him on here. You can see all the garbage up here. Now what we want to do is we want to clean that up a little bit and do so while these items are still selected. So while it’s still selected, go over here to the erase button or erase tool and just already erasing our way. And the reason why you want to do it while it is selected because then the background of this image being pasted onto shows up versus erasing the entire background as well. Let me show you what I’m talking about here. Of course, you can spend time cleaning that up. Okay so we are going to deselect this guy now. So now it’s deselected, now screw over here the eraser tool and I’ll show you what I was talking about. You can see that it is erasing the background of the image as well. It’s pretty close because I’ve chose the background color to match this background as closely as possible. But so it’s kind of scurry. Again do the clean the app or the erasing while it is still selected. And there you have it. Now we can go over here to the move tool. I’m going to hit my control Z because you can always hit the control Z and go back and finish up your cleaning and everything. But now I’m going to move this guy over here to the side and kind of down a little bit. This way it looks… Yeah there you go. Go back up here and select my foreground tool and my mouse button deselect them. Now that is one scared-looking donkey. He’s wondering, “What the heck am I doing at the desert here now?” Hey, that’s just our quick introduction to the Foreground Select Tool. Hope you learned something from this video and the old imagination used are flowing on us on how you can this particular tool as well. And that pretty much brings to a close the videos on the selection tools. 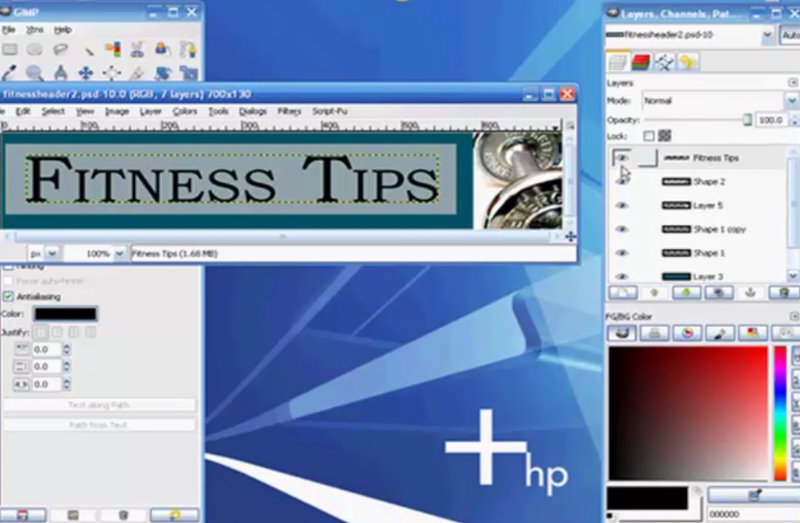 Next, we’re going to get in to some additional tools here and show you how those functions can help you with your Gimp. Thank you very much for watching. Have a great day! 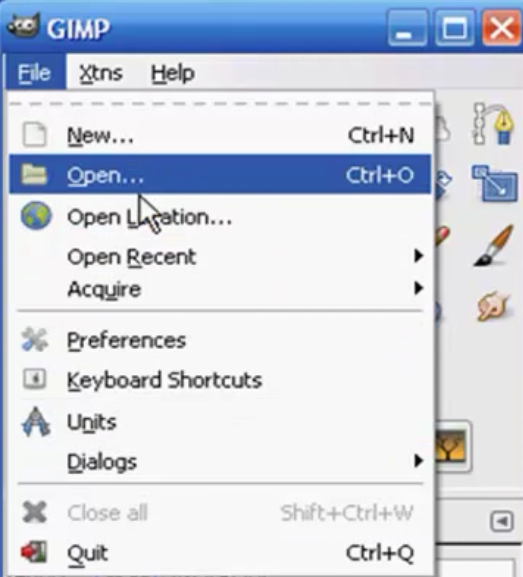 Hello and welcome to this video series on the Gimp. On this video, we’re going to be going over another select tool up here in our toolbox. This is going to be our “Scissors Select Tool” and it’s a little bit different than these other select tools in that it gives you a little more flexibility to the area that you are selecting. But aside from that is you can see it has its similarities too. We can feather the edges, antialiasing, and the different modes where you can add or subtract on the selected areas. But this one does so by connecting the dots so to speak. So let’s go and get started here by cutting out and manipulating the area around our little spilled ice cream if you will. So there’s our first dot and the second. As you can see, it kind of puts lines that connect those dots. That’s not exactly staying on the line. Now I want to point out to just above my scissors next to my pointer, there’s a plus sign. When you get back to the original dot you can see it turns into an infinity symbol. So whenever we get here, we’re going to click on that, it basically completes our selection. Now you can manipulate this by grabbing one of these dots and pulling out, and adding dots, and again you are manipulating this selection area here. Now once you’ve completed your selection area, you hit your enter key and that completes your selection. So all the little marching ants here inside of that is your selected area. Now, let’s demonstrate that a little different way than we have using these other selection tools. 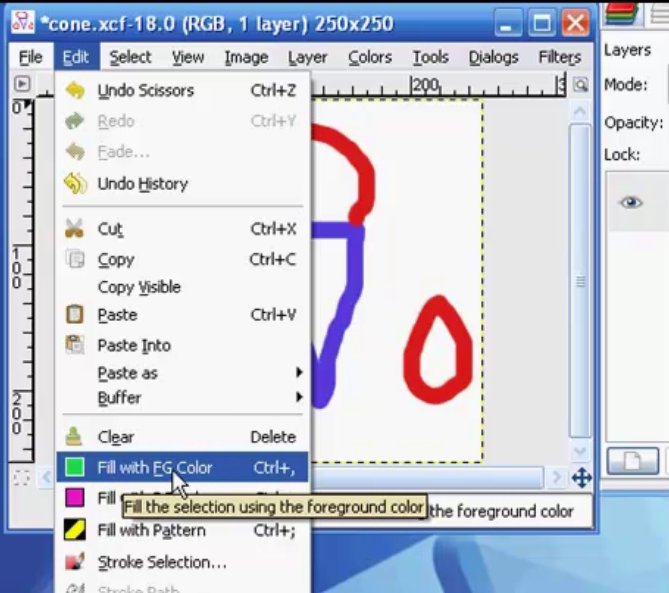 Let’s go up here to the edit button in our toolbar and down here we can either clear the selected area, we can fill the entire area with a foreground (that’s the FG color). And here we have our foreground color and the background color. And you can change this simply by clicking on this, and you can change this to purple, green, blue, or any variation thereof. Or we can go up here if you’re going to be a little more precise and this gives you a little bit more of an idea as the blending options you know what looks cool, what doesn’t look so good. We’ll get into the bucket or the color fill section at a later video but for the time-being, we’ve got these two as our foreground and background colors. Now you go to the black and white by just going over here and clicking on this and you go back to the original black and white. So I’m going to change this again. We’ve got green here and the background we’re going to go with a little pinkish color. So now, we’ll go back up here to the edit and we’ll want to fill with the foreground color just click on that. If you want to fill with the background color and go with that. 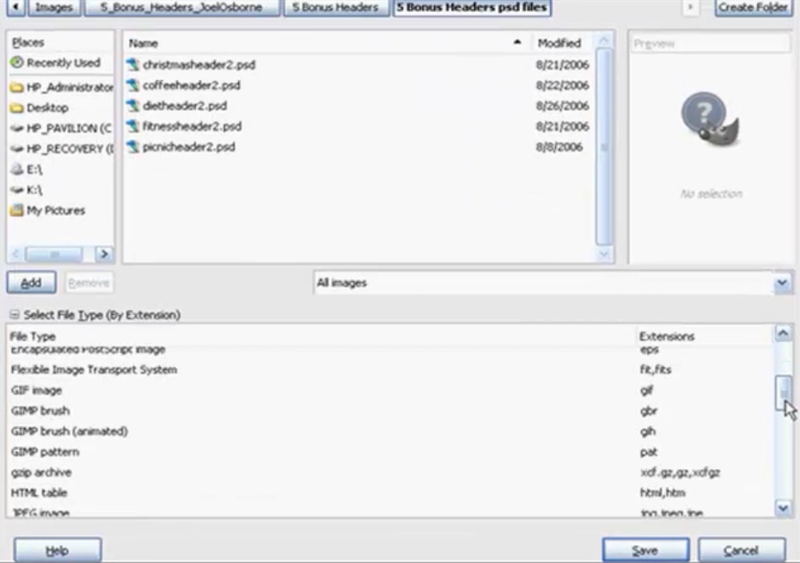 Now under the bucket fill tool, we see the different options we have here. Under the pattern fill, you’ve got several choices you can work with. Right now, we’ve got the warning pattern. You know the black stripes on the yellow background. 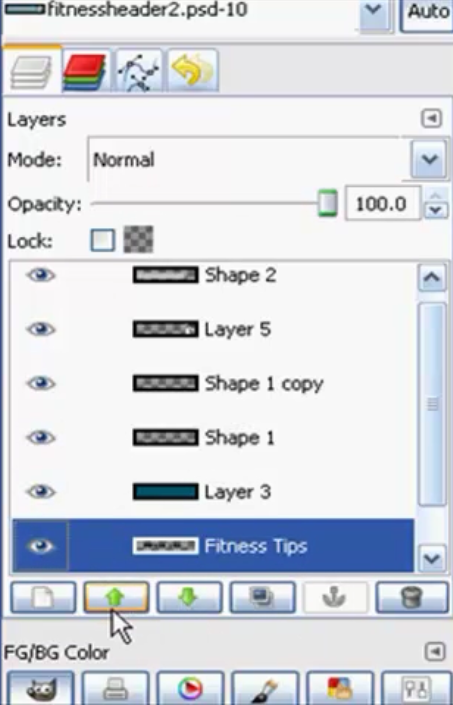 You just simply click on this icon and here are several patterns you can choose from. Now in another video we’re going to be getting into later on I’ll show you how you can add to your pattern selection here. Like for example, this one is pine. We’re going to do the same thing here. Just click on this and now we have our pine fill. Or you can do the same thing up here by fill with pattern. Whatever pattern you have here, you can fill it with that. 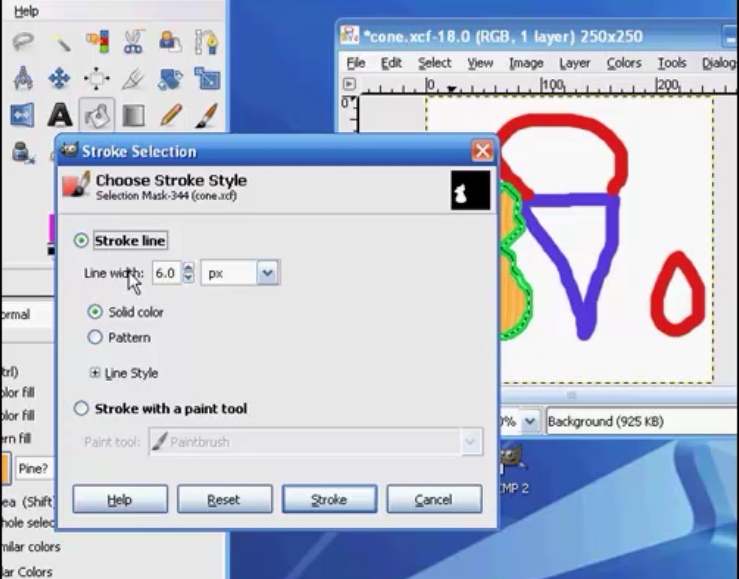 Now, the stroke is basically an outline of the selected area. Let’s go to show you this. And you can determine solid colors, that’s basically we’re going to use here and just click on stroke. Whatever the foreground color is, it’s the stroke. And you can change that too. Let’s go and switch this around, edit, stroke, solid stroke and you see we changed it to the foreground color currently. 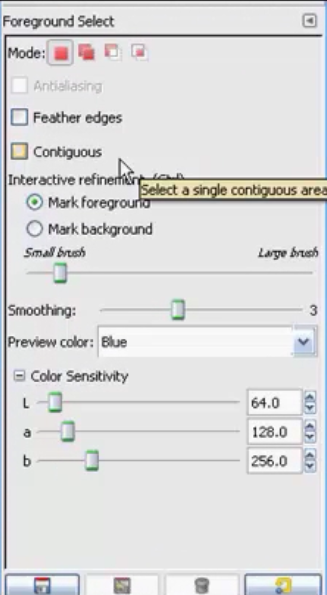 So that is a quick introduction to the scissors tool and a brief overview of the fill section of the color selection tool. 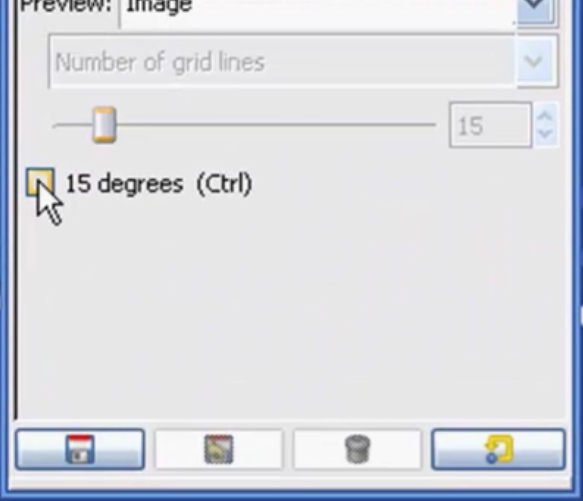 We already get in to the bucket fill tool in a later point but again I just want to demonstrate some of the things you can do with your toolbar up here at the top under the edit selected area. 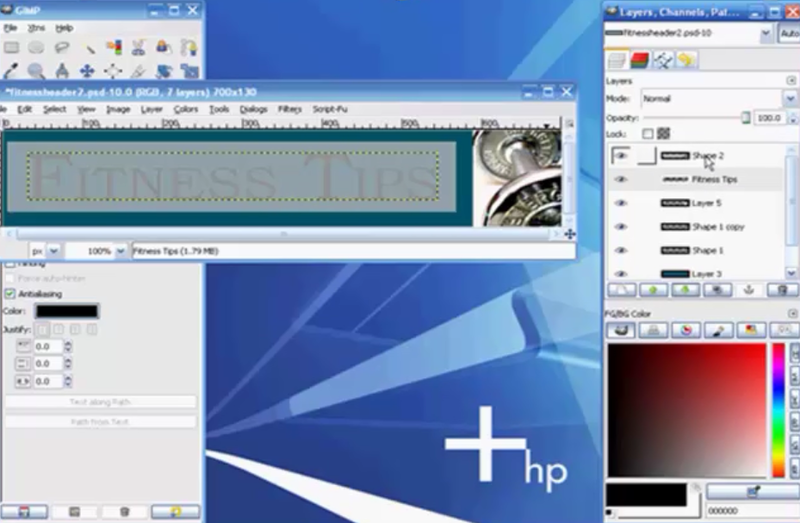 So hopefully you learned something out of this video and we’ll get into more applications of these tools in later videos but for the time-being again I’m just introducing you to the various functions of each of these tools. Thank you very much for watching and have a great day!